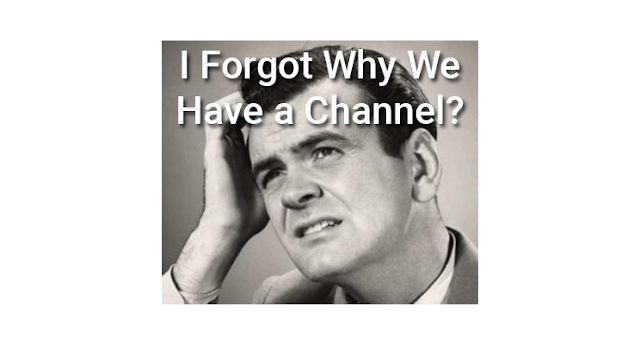 A few thoughts....: Have Channel Sales Executives Forgotten Why We Have a Channel? Have channel industry sales executives forgotten why we need a channel to build business? Is this even a legitimate question to be asking? Of course, we all know the reason for a channel. It is to expand a vendor’s reach in the market through capable, enabled, and motivated business partners that can generate new customers for our brands. Partners provide vendors a multiplier effect by cross-selling a vendor’s brand to many of a partner’s current customers. This working relationship is a win for both parties because when a partner sells a vendor’s brand they also can sell additional partner-delivered services. At the same time vendors gain new sales they would not have generated on their own. So why do so many channel sales executives seem to misunderstand this basic concept of the purpose of a channel? Let’s better define the problem. 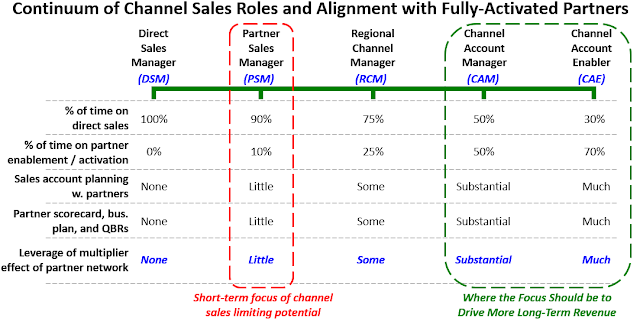 The Partner Sales Manager Role - Given the intense pressure of quarter-to-quarter sales targets at public companies, many have transitioned the traditional role of a Channel Account Manager (CAM, PAM, RCM, etc.) to a 90% direct sales role and 10% and fading role of a traditional channel manager. This traditional channel manager role as a business consultant, enabler, trainer, and motivator has morphed into a part-time or even smaller role to make way for a shorter-term focus on closing deals - today, tomorrow, and the next day. 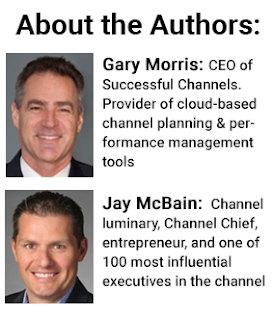 More channel executives have turned the focus of their teams on developing and closing deals for their partners vs. the role of activation, enablement and sales-assist of partner developed opportunities. The pressure of delivering short term channel sales sacrifices the development of enabled and motivated partners that are capable of developing sales opportunities on their own. As a result, partners have become too dependent on the PSM to identify, develop, and close most or all the opportunities within their client portfolio. This process is crippling the multiplier effect of having a channel and reducing the self-reliance of a partner organization to become a competent and motivated seller. It is important to take a step back. The channel organization’s role in a company has steadily increased in visibility and value over the past ten years. In the past, many channel departments would be buried under layers of sales, marketing, operations or financial management. With over 75 percent of world trade flowing indirectly across all industries, many CEOs have elevated the role of the channel chief directly into the boardroom as a key member of the management team. One of the consequences of this added exposure is the pressure to drive KPIs that are directly reported to the board in private companies, and publicly in listed companies. The channel organization has a myriad of responsibilities to their partners that include sales, marketing, operations, support, finance, legal and supply chain. In fact, the average channel professional has 75 distinct roles. Understanding the nuances of a specific territory, including competitive strengths, weaknesses, opportunities and threats, which allow a channel manager to build a strategy with a partner on a deal-by-deal as well as macro level. Sales managers tend to be much more tactical in nature, and most strategic planning is at a customer or deal level. Good channel managers understand that enabling a partner is critically important and so they spend their time ensuring that they are covering the details such as solution creation, logistics and compliance. It is more than just selling a deal, it is ensuring that all the ducks are in a row so that many downstream deals can be closed as well. This is the multiplier effect of having a channel. The economics of running a channel territory are much different that running a sales territory. Beyond things like revenue targets, contract profitability, and pricing strategy, channel managers must also focus on areas such as inventory management, partner cash-flow, and distribution terms. There is a real danger in focusing a channel team too much on revenue and tactical deal flow. While the win rate per opportunity may be higher in the short term, the multiplier effect of self-sufficient channels will hurt long term success. Striking the right balance of a channel team between driving deal revenue and channel enablement, engagement and strategic planning is imperative. It is the classic “teach a person to fish” analogy. There are a few difficulties in the measurement of this channel role, especially as it is reported to the senior management team. Many of the KPIs are soft by nature, and that doesn’t play well in a boardroom where sales and marketing professionals are managing now to the seventh decimal point. As it is a longer-term investment, it doesn’t play well in the daily/weekly targets that businesses are being driven against. Another danger in focusing a channel team too much on sales is that they may miss the changing dynamics of the partners they are working with. Channels in all industries are going through a major transformation brought on by multiple factors including digital transformation, demographics, new competitive pressures and economic realities post 2008. In the IT channel, for example, there has been a roughly 30 percent decline in the number of partners since 2008, with an additional 40 percent of remaining partners looking to retire in the next seven years, according to CompTIA. By the end of that seven year window, over 75 percent of the channel will consist of millennials. An effective channel manager would see these shifts happening and refine programs, incentives, messaging and even coverage to support it. Another major shift in channels is being driven by changes in the customer buying journey. Ten years ago, the CIO made 90 percent of technology decisions in an organization. Gartner is forecasting a complete reversal by 2020, where 90 percent of those decisions will now be made by business professionals in the lines of business. For example, the VP of Sales or VP of Marketing is now the main buyer of technology solutions – not the IT department. This new buying journey, once called rogue or shadow IT has generated new areas of influence called the shadow channel. (http://www.jaymcbain.com/2016/10/the-rise-of-shadow-channels-5-new.html). A channel manager will understand that a customer VP of Marketing may not have IT in the room during a technology decision - and there is a good chance their traditional partner won’t be in the room either. Having a macro level strategic view will guide a channel manager to make sure their organization is in the right customer discussions and exerting the right influence. This could involve getting closer to accountants, digital agencies or legal firms. It could also include diving deeper into other company’s ecosystems, building an independent software vendor (ISV) program, or even participating in the startup arena around the solution areas. Having a channel manager focused too much on sales will hinder the multiplier effect of channels, drop the satisfaction of current partners who are looking to brand themselves and become more self-sufficient in the marketplace, and miss the ever-changing partner and alliance ecosystem.